First posting from my laptop (Sony Viao VGN-TX27GP, see now they have brought out TX37 with new intel cpu solo, oh hum). All other postings have been from SE k800i phone. Which I hate except for the camera. Buggy and slow, and vodafone price structure is day light robbery. Why can SE Japan AU make a better phone than SE World Vodafone, because they can. The journey from Savilla to Madrid was uneventful, as travel should be but not good for the blog. The same goes fro Sevilla to Bilbao. The talgo. Which a slow express train that chugs along and gets you there. Scenery out off the window reminded me of low land Scotland, except it was not raining. The rail system seems to have been rebuilt from scratch, nothing looks older that a couple of years. No delays, just a straight line to Bilbao. Stopping off at unannounced stations. When it comes to information the Spanish rail system likes to keep you guessing. Not as bad as the time 13 years ago when I got a train from Barcelona to the east coast. Nothing was said at each station, and the stations had no names. Felt very eerie, pulling into stations with no names, and most of the places had nothing but the station. Ima sure I could distant cow bells in the distance, and stampeding cattle. 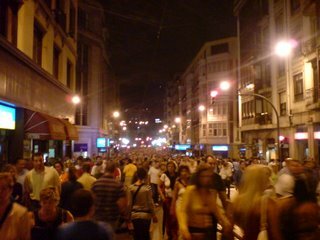 Anyway when I arrived in Bilbao it was party time. It was like all the spanish students usually roam the streets of Europe and all flown back to Spain for one grand meeting. All with their Don Simon vino tinto and 2 litre Coca Cola bottles, standard issue for any young person in Spain. No taxi's were available, the streets around the station were blocked off. I asked a policeman how to find my hotel ( booked through www.tobook.com). He gave me directions, simple enough walk down the road and across the bridge. People were walking in the same direction as me. 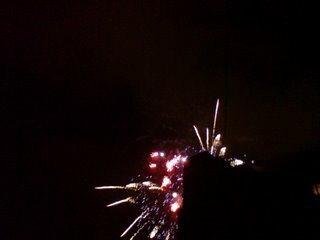 The time I reached the bridge, it was blocked by people, then the fireworks started. So there I am stuck on the wrong side of Bilbao with my heavy rucksack , and smaller ruck sack, sweating away. Great I thought, no way I am going to make it past these people. 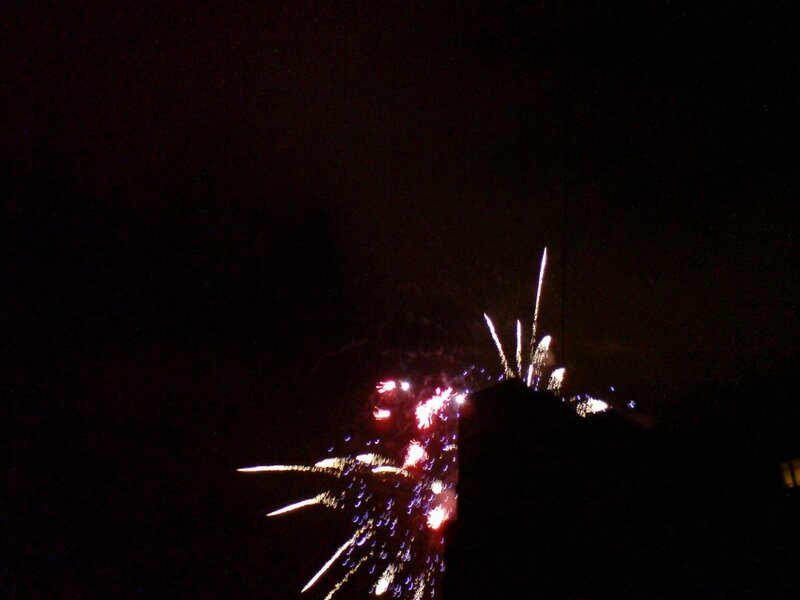 So waited for the fireworks to end, thank good they are not as rich as the Japanese, half an hour later. Crowds cleared and I could pass. The hotel was in the centre off town, so was everyone from the Bilbao. The map I had was crap, as usual. I asked a couple of people they had no idea, one woman walking her dog could not read the map or my address and had no idea. So I phoned the hotel, why did I not do that earlier. I asked for directions, they said they could not give me directions. Just kept saying no. I aksed them how the hell they get to work then? and put the phone down. Evetualy lady luck gave me a break. I asked a couple dressed in blue for help. They walked me to the street. 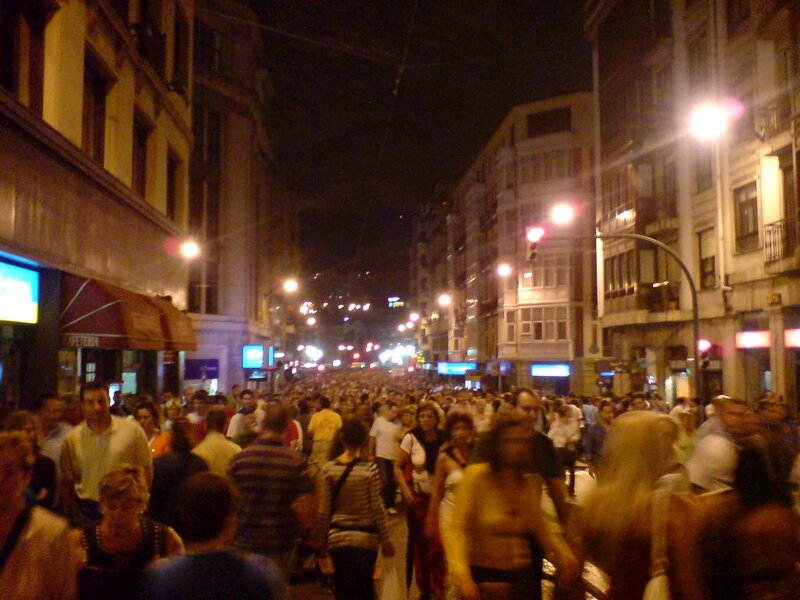 They told me that today was a party for the people of Basque, part of 9 days of parties. Took me three hours to find the hotel. Crashed out on the bed straight away. I am off now to check out the rest of the city, I think I sow most off it last night as a tramped around in dispear swearing at the crow. Guggenheim Museum and the state of the art metro system, that is what the guide says I should check out. I would like to thank robert for leaving the first comment. Even though it should be "robert was 'ere". He always wanted to be!